Heads up: At River Pools we manufacture and install fiberglass pools only. However, this filter system guide applies to all three pool types. 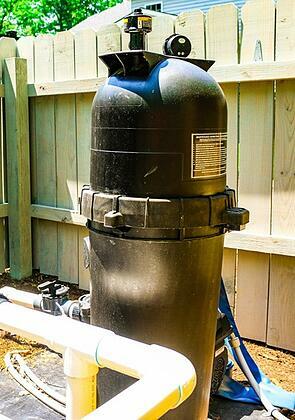 Your pump pulls the pool water from the skimmer(s) on the pool wall and the main drain(s) on or near the bottom of the pool. 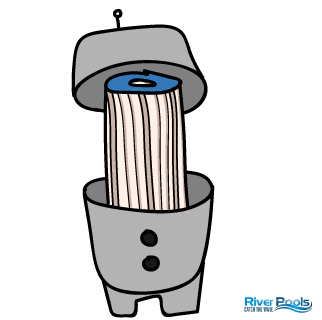 The water flows through the pump to the filter, which removes dirt, debris, and (if the filter is good) bacteria. 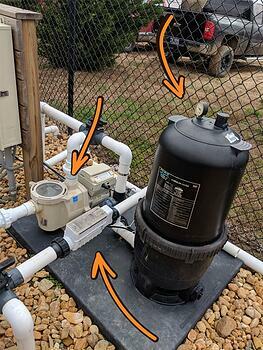 After the water is filtered, it flows through the plumbing to the heater (if you have one) and then the salt chlorine generator (if you have a saltwater pool). The clean water returns to the pool through the return jets on the pool walls. These features are probably already familiar to you, but just to recap. A main drain is the big ol' drain at the bottom of the pool. Side note: You may not have a main drain—they're becoming less common in residential pools, in favor of only skimmers. 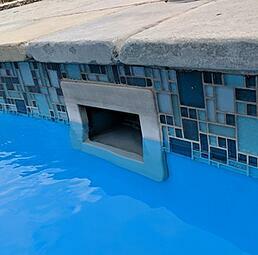 This is because for smaller pools, main drains aren't always necessary. 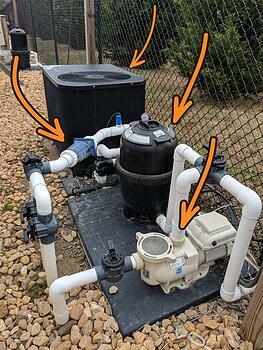 Water flows through the skimmer and the main drain towards the pump and filter to be cleaned. 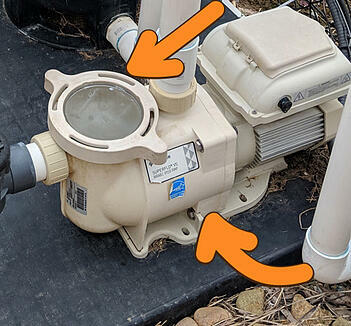 A pool pump generally has a big, round part at the front and then extends backward. That big, rounded part at the front (covered by a lid) is the strainer pot. It looks and acts, predictably, like a strainer. A spinning impeller inside the pump pulls the water in from the pool. This water hits the first part of the pump, the strainer pot, which catches any major debris. After the water goes through the strainer pot, the impeller pushes it on to the filter. 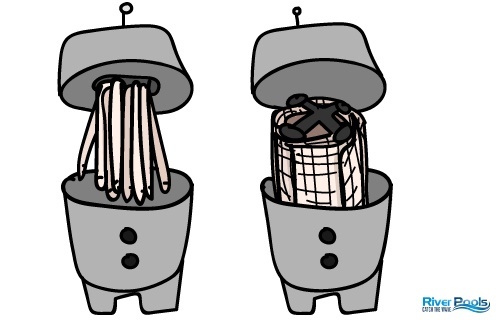 A cartridge filter uses cartridges—big sheets of polyester cloth or paper folded accordion-style—to catch debris. Some of these filters only need a single cartridge; others need multiple. 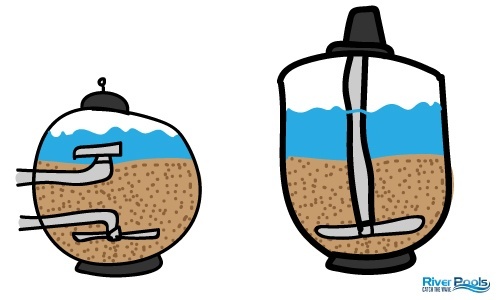 A sand filter is straight-up a tank full of sand. Slotted lateral pipes at the bottom disperse water evenly through the sand to catch debris. D.E. filters use 8–10 filter grids/fingers covered in D.E. powder (diatomaceous earth, which is basically fossil dust) to catch debris. The fingers may look like hanging stalactites or overlapping curved shutters, depending on the model. A quick note about filter quality! Dirt and debris are measured in microns, which is short for micrometer—one-millionth of a meter. Yes, that's a lot of zeros. A filter's "micron level" tells you the size of the smallest debris it catches, so a lower micron level means better filtration. A pool heater tends to look big and clunky. Fair enough; it has a lot of work to do. 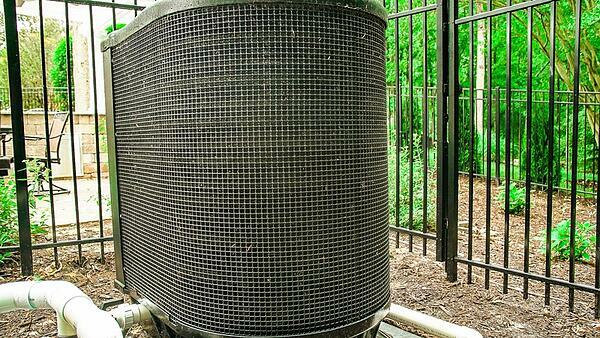 You can choose to get a heat pump with a chiller feature. That's especially awesome if you live in a toasty climate, have a shallow pool, or use an automatic pool cover. Fun fact: About 19 of 20 of our customers who install heaters choose heat pumps because of their dependability and low operating cost. 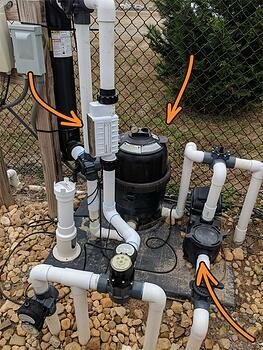 Heads-up: If you have a traditional chlorine system in your pool, you don't have to worry about this section. 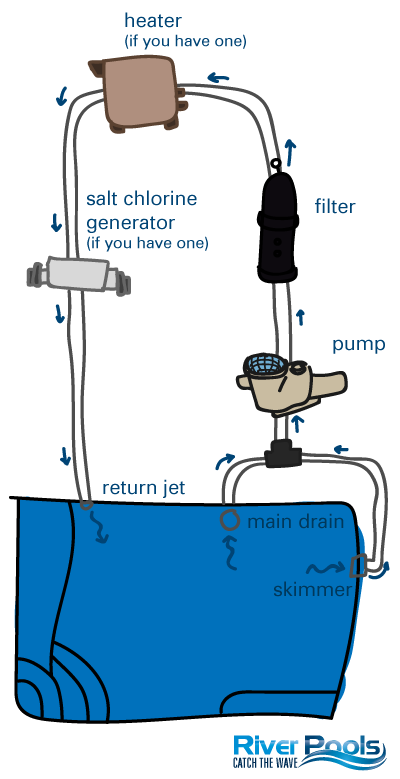 You don't have a salt chlorine generator, so skip on ahead to return jets. Or read this section anyway. Whatever floats your goat. 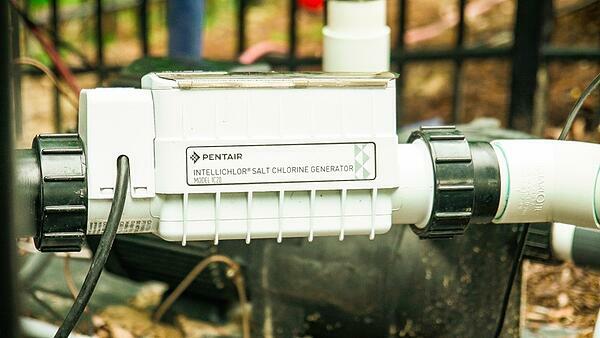 For a saltwater pool, instead of adding chlorine to the pool water, you add salt, and the generator converts it to chlorine. The cell is what's connected to the plumbing pipes. The control panel is usually a little farther away. After being filtered, your pool water flows through the cell. Inside, a series of metallic grids with a low-voltage current create a reaction that converts the salt down to little bubbles of pure chlorine. This pure chlorine reacts with the water to form hypochlorous acid, which is what cleans your pool. Return jets... well, they return the filtered water to the pool. Spa jets are a variant of this. I'm trying to think of a way to make it more complicated, but it's not. 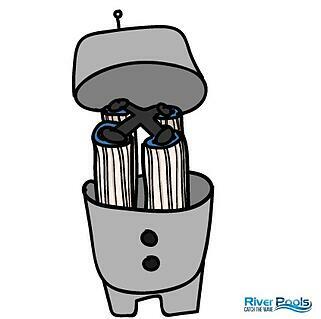 Let's see if you can pick out the 3 major parts of your filter system: the pump, the filter, and the salt chlorine generator. How about in this configuration? Want to learn more about pools? I mean, you're basically a pool pro now. But it never hurts to expand your repertoire! Our blog articles and our YouTube channel videos answer every question you may have about pools, throughout both the buying process and lifetime ownership. Check them out, and then impress your friends and family with your pool knowledge! Based near Richmond, VA, River Pools specializes in manufacturing and installing fiberglass pools because we're firm believers in their long-term quality—they're beautiful and durable, require little maintenance, and have a quick installation time to boot. 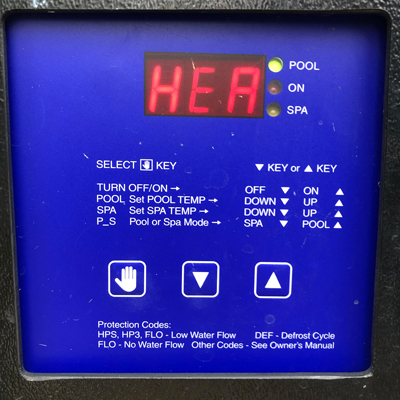 Our pools are also available nationwide through our River Certified Dealers, who install them using the above-and-beyond standards of The River Pools Way. We're excited to help you any way we can! Next: Where Should I Locate My Pool Filter System?